Compression socks, you are probably hearing all about it. Quotes like: ‘’The solution to exhausted legs!’ and ‘I’ve never recovered so quickly after a workout/exercise as I do while wearing compression socks!’, float around like leaves in autumn. So, why not wear them during skiing? 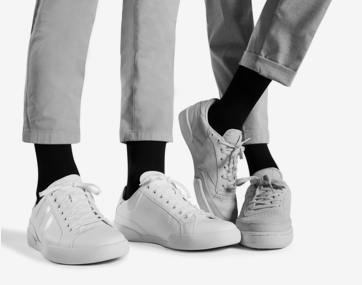 What is important when it comes to winter sportswear? Functionality and comfort is the most important part. Sure, looks are also important. However, if your sportswear is too thin or too thick, you’d probably prefer a good fit while skiing. They can still have such a nice design, the fit is incredibly important. They should be comfortable, not too hot because of sweaty feet and not too thin in relation to cold feet. In addition, there is nothing more annoying than a sock that slips down! As far as winter sportswear is concerned, no one is really whining. It just has to be perfect, so you can enjoy your winter sports. It’s great to go winter sporting, but the word ‘sport’ isn’t in there for no reason. And if you only hit the snowy mountains for a week, you want to make the most of it and ski as much as possible! Nothing is worse than having to quit skiing halfway the holiday due to sore legs or huge muscle pain from the day before. Therefore, STOX Energy Socks developed the STOX Skiing Socks. 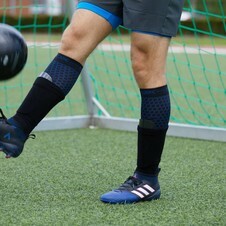 These socks reduce muscles fatigue and increase body waste disposal, which accelerates recovery. How? They are compression socks of course! And compression socks increase blood circulation, resulting in maximum oxygen capacity for the muscles. As a result, you will experience energised legs throughout the day. The Skiing Socks are processed with Merino wool. This material is particularly good in regulating body temperature because the smaller fibers lock body warmth, similar to a person who is heated in a sleeping bag. So no sweaty feet! 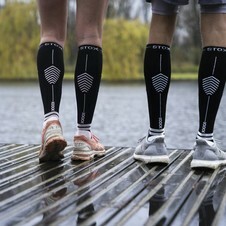 STOX Energy Socks is launching super cool new designs on the ski socks this year. The socks have been updated to match your wishes and needs. A great advantage of compression socks during skiing is that they are well tight. They are more difficult to put on than normal ski socks, but once they sit, they fit. No more socks that slip down! Once you get used to the compression socks, you’ll notice that they’ll fit perfectly and ski more comfortably than your 'ordinary' skiing sock. Other benefits of compression ski socks are, your muscles and tendons have more stability, you get less cramped and the socks provide more dampening of the muscles during impact while skiing. In addition, after the first day, you’ll be ready for the next day, because your muscles recover a lot faster. Excited about skiing?! Order your STOX Skiing Socks and get in the winter sports fibe!